Tonight we've got a new map for you! You'll start at a supermarket, surrounded by some pretty ponds. There are tons of girls shopping today! :S ... Collect the items, but don't get too nervous around the girls! Or you'll have to start over. This update does not have as much as I wanted to add for the night. It took a long time to build the map, and I still don't have enough tiles to add a great deal of variance for an entire shop. I also put some super basic items in (with placeholder text, until I get sprites). 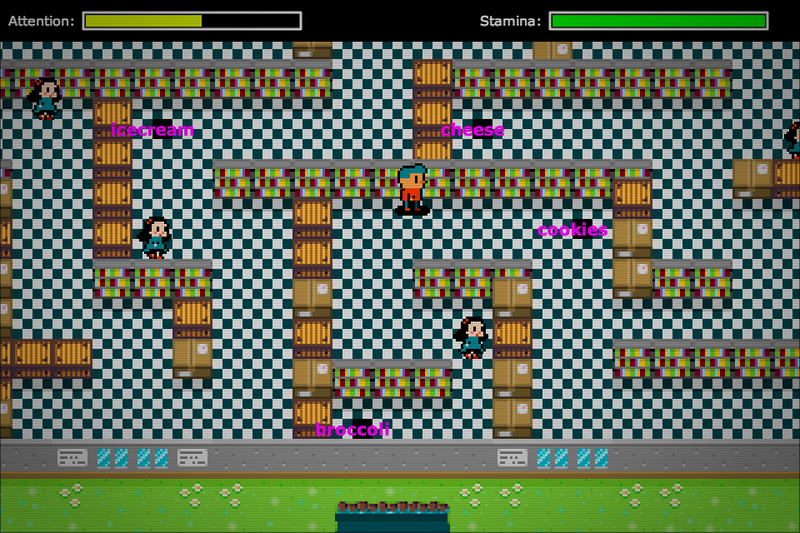 The items can be collected, but there's no UI for it yet. The last thing I added was a simple but effective "scanline" and "halo" effect, which works well with the scaled pixel art. And now it's really starting to feel like a game! :D It can get ridiculously frantic trying to collect the items, but it's not impossibly hard. I might need to do some more tweaking on things that affect the level of difficulty. Any comments or suggestions would be appreciated at this point! Last bit of info to note! I also have some new art assets that I didn't get a chance to add tonight. There's a new girl, and some animated effects for the "nervousness". Also the status meters on the HUD will be redone sometime soon, since I also have a new design for those! Transition screens (explaining the objective for the map).